Riley Sweeney has posted his voting recommendations for the 2014 General Election. They are always worth the read. PDC map of i594 financing showing $3.2M in contributions from New York. I have a hard time buying all the mass shooting stories we are fed in the news: The last group of spree killing stories have all been about troubled young men and when you read the press reports later everyone from novice psychologists to journalists have a field day trying to perform amateur criminal psychoanalysis and discover what happened. Internet and Facebook commentary spread like wildfire. Reader: I generally support FUSE endorsements and think they do the progressive community an important service. I recommend you become a member and join their mailing list. I may personally vote against their 591 and 594 recommendations; I am researching those ballot measure in an ongoing post. FUSE has a humorous rebuttal to pro I591 and con 594 voters like myself; unfortunately it is not a technical or legal piece. The 2014 general election is here! Your ballot is filled with candidates and measures that will make a huge impact on equality, economic security, and the future of Washington. Voting in the November 4 election is an important first step toward retaking the state Senate and supporting progressives in many local races that will impact you, your neighbors, and your children. To spread the word about all the other races on your ballot, we worked with Washington's leading progressive organizations to produce the 2014 Progressive Voters Guide to the general election — your ticket to highly-informed voting based on progressive values. The deadline for mailing in your ballot is November 4, but you should join your neighbors and mail it in today! Please forward this guide to your friends, family, and co-workers — they can find their own locally customized version at ProgressiveVotersGuide.com. You're one of the thousands who have committed to vote this year. This is the time where it really counts. Ballots have already gone out in some counties, and all ballots will be out by Friday. We're really relying on you, our strongest supporters, to turn out for Democrats. You wouldn't have committed to vote if you weren't someone who cares about making the right choices in the election. We want to help. Do some prep work. Take a look at your voters guide. Go to our Candidates page and visit the websites of the Democrats running in the election. Find endorsements for your ballot. Local Democratic organizations have made endorsements in races up and down the ballot. You can feel confident that endorsed candidates represent Democratic values. Just go to the Endorsement Finder and enter your name and zip code to find a set of recommendations created just for you. Deposit your ballot into a mailbox or dropbox. Ballots must be postmarked or in a dropbox by November 4th. Please, vote early. 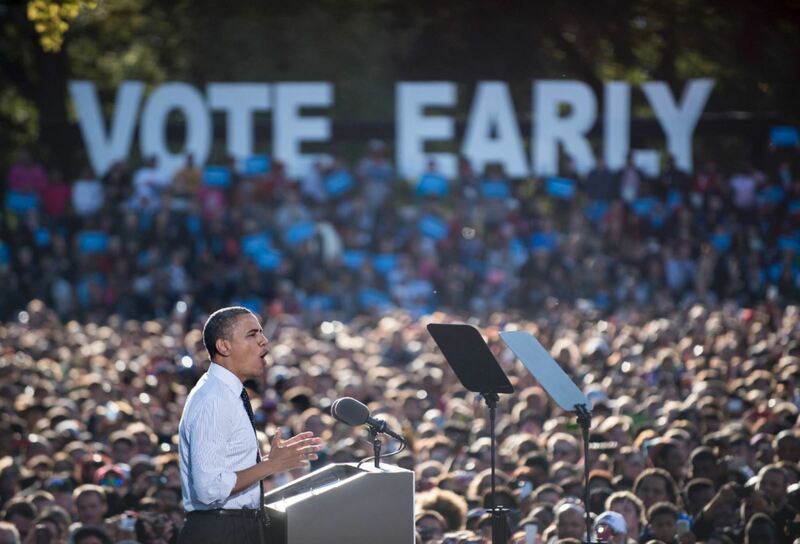 If you vote early, then your vote gets counted early. You can track the status of your ballot on MyVote. Campaigns can then focus on reminding people to vote who really need to be reminded, not great Democrats like you! This post is now out of date. I594 passed amidst dramatic expenditures. It is now the law. Donations for and against I594 as of 10/16/14 in top graphic bar. Currently I594 has consumed an astonishing $10M of the $81M total contributions for WA election for 2014 to date. . $2.3M of the $9.5M donations for I594 come from New York State. Screenshot graphic from WA PDC. The 'WA Alliance for Gun Responsibility' has received a donation of $1M from New York State from EVERYTOWN FOR GUN SAFETY ACTION FUND. Presumably, if this were a WA PAC or non-profit or 527, this organization would have to list the donors that made up that $1M contribution. But in this case, an out of state organization has injected $1M into a WA initiative race from some unknown number of donors, none of which the people of WA can possibly know. How does this conform with WA public disclosure law? Below the break is the R code snapshot look at the pro I594 contributions to date. Ninety percent of the $8,383,561 pro I594 contributions to date are under $500. This might mean a little more if the sums of the top ten donation amounts (range $500 : $1M) weren't ~$7M of the $8.3M of contributions. The top ten donation amounts themselves comes from only 29 unique contributors out of a total of 7,256 unique contributors. The sums of the top ten Contributor names are ~ $6.1M of the $8.3M donations to date. Those $6.1M contributions come only from Washington and New York. Politics is a sport for the rich these days. Looking at the top ten Contributor names on the list below confirms this for I594. The Human Services Forum tomorrow night is your best chance to understand candidate view points on social services. You can preview the candidate answers to some of the forum advance human services questions here. Reputedly, the debate will broadcast live on BTV 10. We shouldn't be shocked, but we are. Once again, the Republicans are turning to huge corporations to finance their votes. A large oil company is pumping $50,000 into the local Republican party1. Coal terminal companies are spending $10,000 to buy our local charter review commission election2. But that's not what shocks us. With Republican legislators busy dining with lobbyists and pandering to global warming deniers, we're surprised anyone still supports their stubborn agenda of non-action. After all, these are the same people who consistently show they care more about maintaining political gridlock and posturing than helping our local families. Your $5 donation to the Whatcom Democrats will help us work to dump Republicans who refuse to work for the good of our county and fuel our progressive candidates: Seth Fleetwood, Satpal Sidhu, and Joy Monjure. We've fought the Republicans before and won. But with our opponents leaning on big business for votes, we need you to help restore balance and get the economy moving. With your support, we win. Click here to help send Democrats to Olympia. Copyright © 2014 Whatcom Democrats, All rights reserved. You are receiving the email because you subscribed to our weekly announcements. 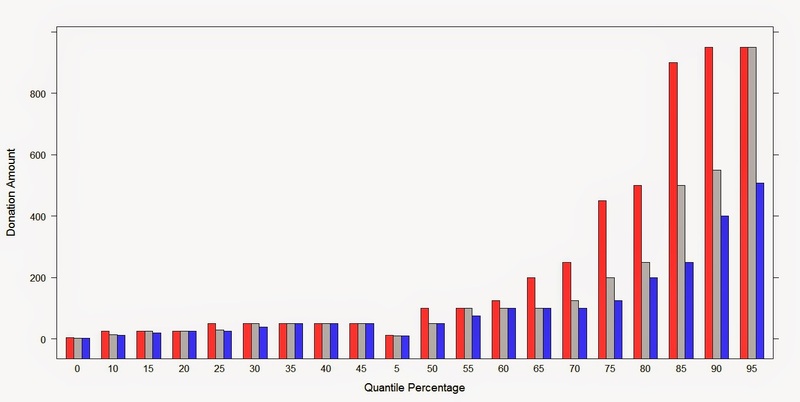 Quantile chart of Republican (red) vs Democrat (blue) Donation Amounts. Donations above $200 are largely the domain of the Republicans in this election. Most of us who have thought about politics have known for some time now that at some very deep and cloaked level, the differences between the Republicans and Democrats don't pencil out as distinct in practice. No doubt the platforms of the two parties appear divergent at first glance, but in many strategically important areas, the respective party objectives end up serving the same economic masters in spite of well meaning (or perhaps well designed) campaign rhetoric. ARRAY['Joe and Josephine Liberal', 'environmental PACs', 'social services supporters']. The "Canadian dream catcher net" will still be built out by Lummi, Costco, hotel chains, POB (airport) between Slater and Bakerview and the Mall. And we will probably still be waiting to see if the Port finds the money to develop Bellingham's waterfront! In this event horizon, your sons and daughters will be able to find jobs in store retail, shoveling coal, dealing black jack, and cleaning rooms. If they aspire for the professional classes (outside medical) or a career in technology, that future will have to be found elsewhere in big cities like Seattle, San Francisco, Boston or Vancouver (BC). Wouldn't it be ironic if Seattle Vancouver (BC) built a clean high tech economy but kept the Reno/Vegas trips, casino gambling, milk and gas purchases south of their border? The big guns will be firing photon torpedoes of campaign dollars in the coming weeks. You might just want to park your space cruiser in the Romulian neutral zone until all the mailers have been delivered and the final votes are cast. Despite my cynicism, I plea with you to please remember to vote. Even if it changes little, please show the world that you vote. Lots of data and graphs on PDC contributions below the break. Code is here. Click to enlarge charts. The online registration and update period for existing voters has ended. New WA State voters may continue to register in person (at the Whatcom County Courthouse) until October 27th. The columns below represent the delta (Orig Election Total - Active Vote Total) by week last month in the Active voter rolls for those who voted in the August Primary and the November 2013 GE. Your ballots will be mailed in Whatcom County starting October 15th. Today, the League of Conservation Voters named Doug Ericksen part of the "Dirty Dozen" for being one of worst elected officials in the country for environmental legislation. It's time we had responsible leadership in the 42nd. This race is important because it will shift the tide in the Washington State Senate and help shape environmental policy nationwide. 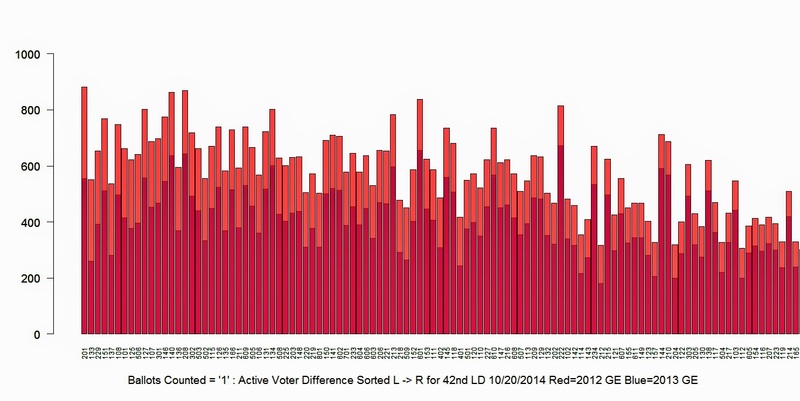 Active and Inactive for voters for Whatcom County 42nd LD at weekly intervals for the last month. Plus 42nd Precincts who have lost registrants between the the 2013 GE and today.These precincts listed below have lost more than 50 registrants or more over the last 11 months. 42nd District total active voters are essentially unchanged over the last 11 months to date. Monday, October 6th is the last date to update your voter registration on line.